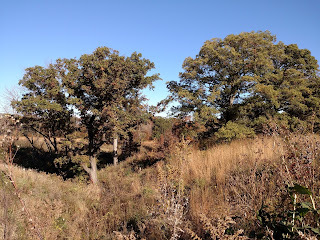 Standing in this restored savanna on a cool October morning is a surreal experience. 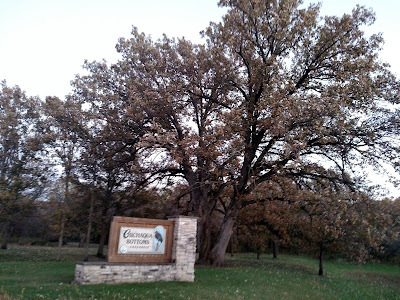 It's a thriving ecosystem yet feels like a furnished home, with its ceiling of bur oaks and carpet of prairie grasses. I feel content as these squirrels, cheeks full of acorns. And I feel comfortable, compared to the rest of the barren cornfield known as eastern Iowa, with its gale-force winds nearly blowing me off my motorcycle the whole way here. In this tranquil savanna there's only a muffled breeze and a sprinkling of sunlight. It's amazing who you'll meet after standing still long enough in the wild. Back to the point. This savanna is like a green, glittering mansion—a spacious one. 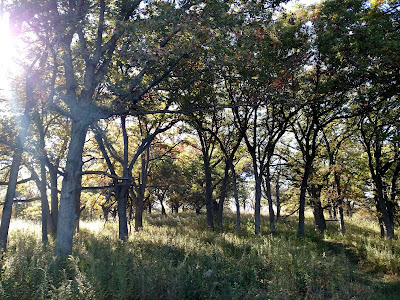 The sprawling arms of the oaks hold a 10 to 50% canopy cover (according to the contested definition of savanna), allowing sunlight to reach prairie flowers blooming below. No wonder early settlers noted the park-like quality of these savannas. 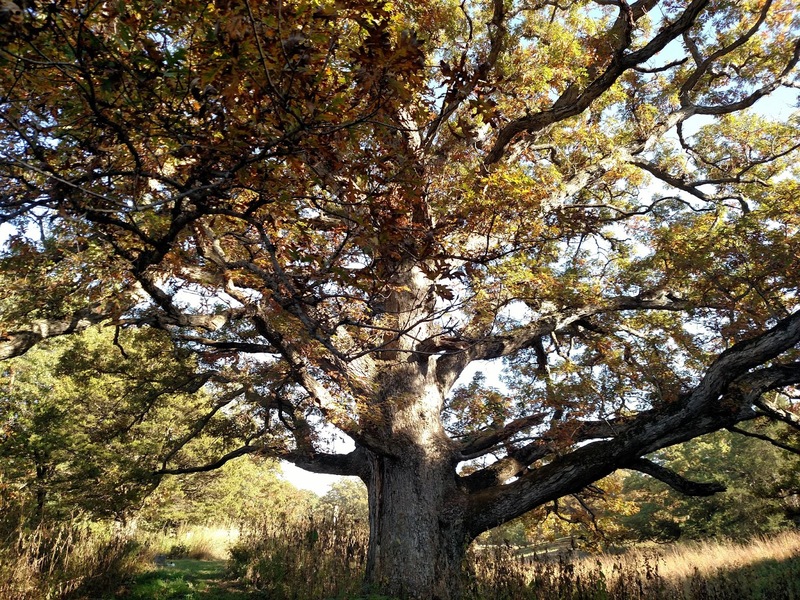 Luckily, today we have a new kind of pioneer—one that plants oaks rather than cuts them down. Luckily we have organizations like oaksavannas.org and the Iowa Natural Heritage Foundation (INHF), who preach the importance and beauty of these ecosystems. 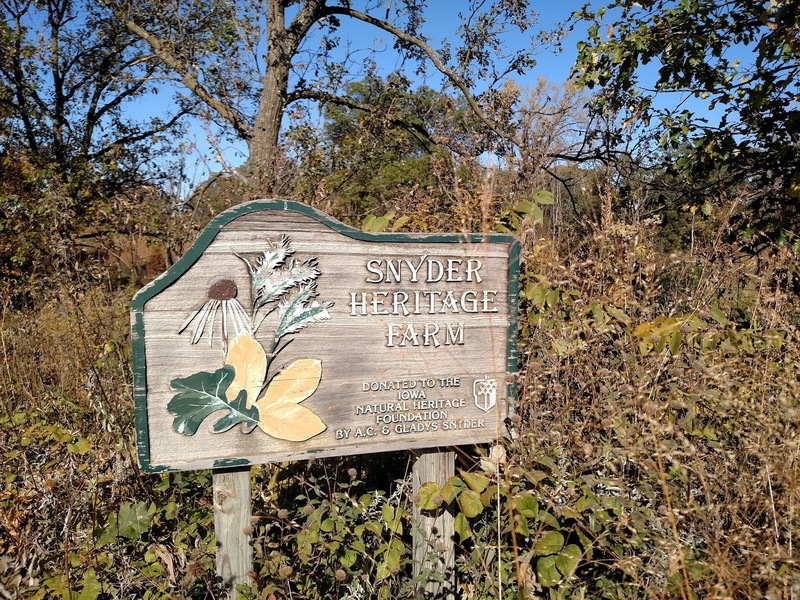 Luckily we have comrades like Ryan Schmidt, a Land Stewardship Specialist at INHF, who's working diligently to restore and maintain oak savannas. 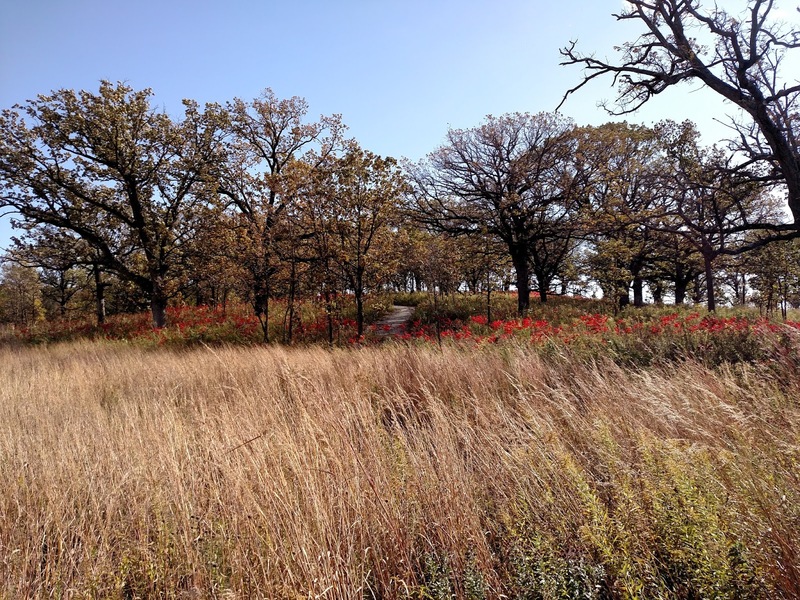 In this article we visit a few of the savannas that have been preserved or restored throughout Iowa. 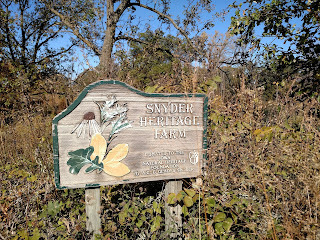 At one of them (Snyder Heritage Farm, SHF) Mr. Schmidt will explain it's land history and the process of restoration. Some of Iowa's early pioneers are buried at this cemetery, with gravestones dating back to the 1850's. The oak roots that embrace their remains must be grateful. While the rest of Iowa's savannas were clearcut or grazed this burial site has been protected and maintained. 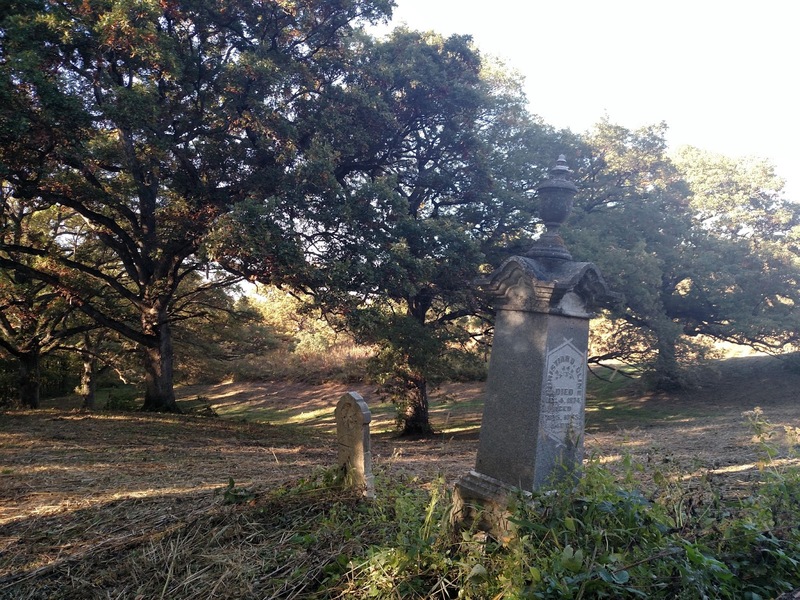 Mowing around the graves and oaks for visitors' access has also prevented the encroachment of woody invasives. 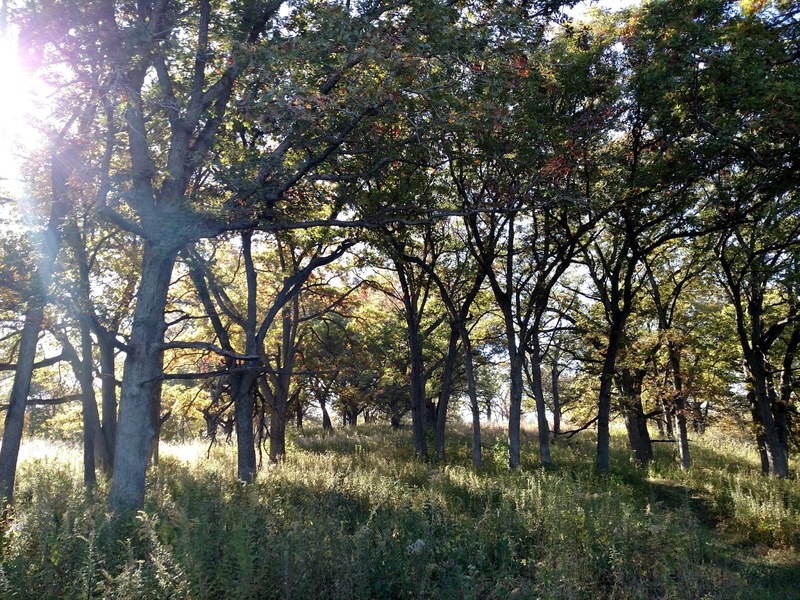 According to the INHF website, this 14-acre site is the "highest quality savanna remnant in the state" and has "some of Iowa's oldest white oaks." 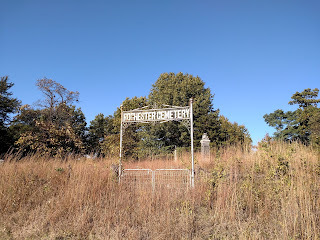 The largest one I saw must have been at least 6-ft in diameter, probably older than the oldest pioneer buried here. The remnant savanna at SHF survived because of topography. Steep hills and deep ravines are not ideal for crops, and therefore these portions of the property were never clearcut and plowed. Instead, they were grazed as wooded pasture and the oaks here were allowed to live as shade for cattle. But decades of grazing took their toll on the understory. 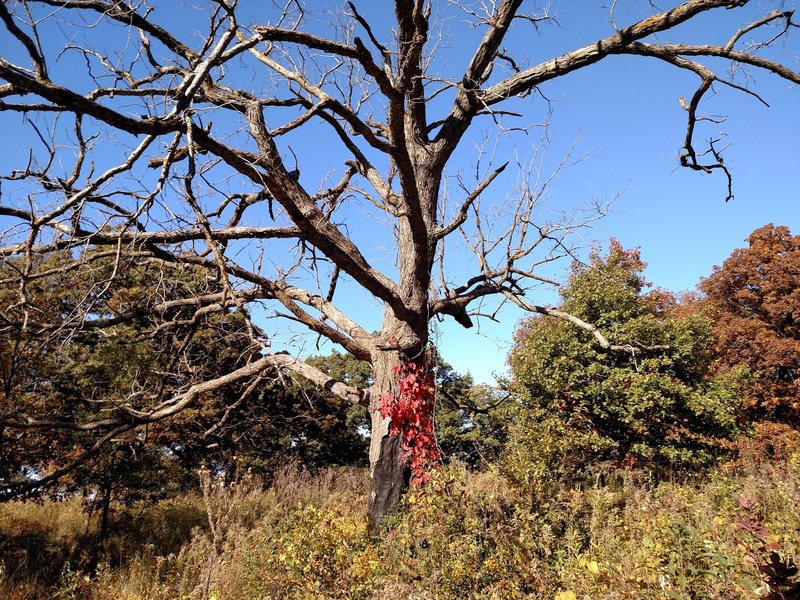 Native prairie species were heavily suppressed, and, when grazing finally ended in the early 1990's, woody invasive species quickly took over nearly choking out the oaks. 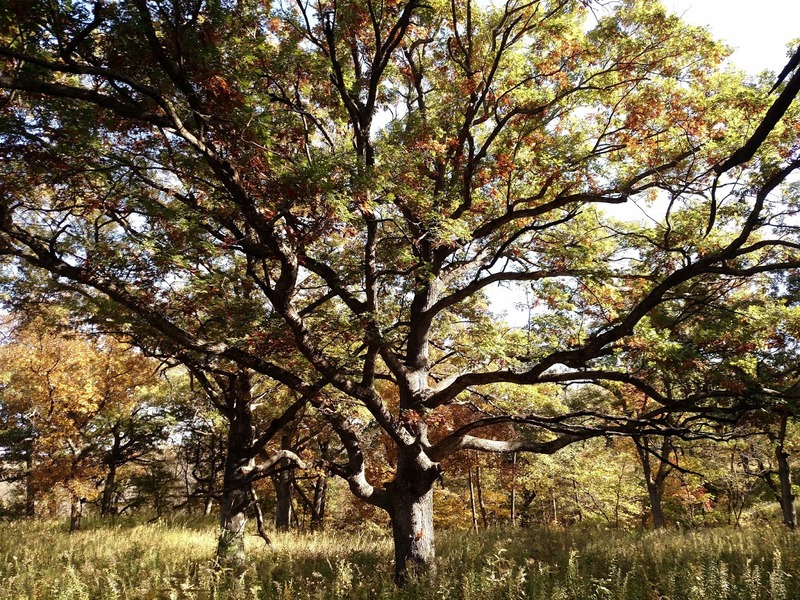 And so began a 20-year battle to restore this savanna. According to Ryan Schmidt, the initial restoration efforts were a battle against invasives, notably Japanese honeysuckle and multi-flora rose. The initial assault consisted of cutting and spraying herbicides. 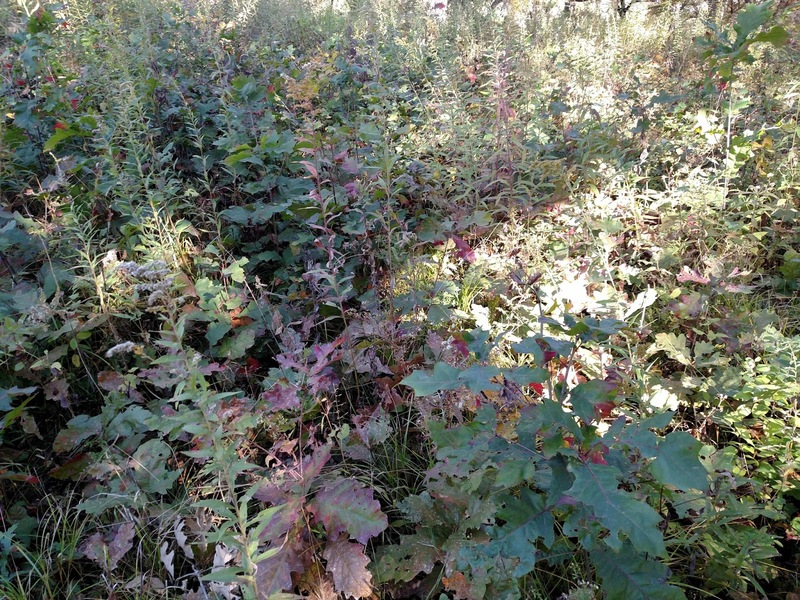 Once reduced to a more manageable size, invasive regrowth could easily be mowed. 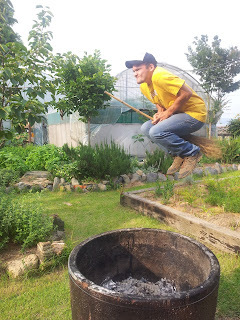 Nowadays, the stewards of SHF have adopted the natural regeneration tool of the oak savanna: fire. Annual prescribed burns check the spread of invasives and unwanted trees, preserving the savannas for its rightful inhabitants who are well adapted to it. The thick scaly bark of burr oaks insulates them; the deep roots of the native understory plants lets them resprout and rejuvenate. Thus historically it has been fire which defines the savanna. Thus it was the suppression of fire by settlers and their descendants which endangered the savanna (along with outright destroying them); and it will be the reintroduction of fire by restorationists like Ryan Schmidt that will help restore them. After 20 years the battle against invasives has largely been won. But there are other restoration efforts are taking place at SHF, according to Mr. Schmidt. They gather and spread seed of native grasses and flowers that comprise the understory. 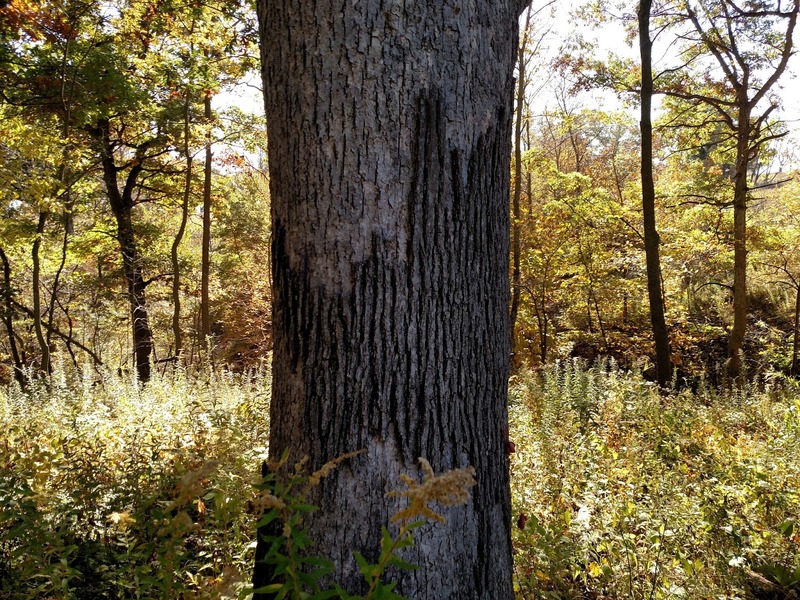 And because each year a mature oak or two withers and dies, they help propagate the next generation of bur oak overstory. This mostly consists of protecting select seedling from fire, a process that would happen gradually in nature, but must be accelerated here given the site's rough history of human mismanagement. Also, adjacent portions of the property—ones that were flatter and had therefore been clearcut and cropped by early settlers—are being restored to prairie as agricultural operations (the source of the project's early funding) are phased out. Bark sections that were sacrificed to fire. 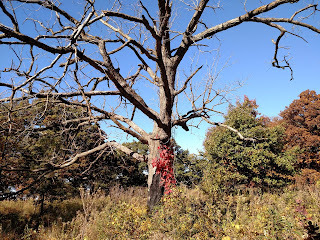 A dead oak of the previous generation. Oak saplings competing to be the next generation. Perhaps in the larger picture they are cooperating. For more examples of ecosystems being dependent on humans for their restoration, see the tallgrass coastal prairies or longleaf pine forests. Neal Smith National Wildlife Refuge is 5,600 acres of mostly restored prairie (see my article on this beautiful site), but has several oak savannas. For a handy list of other restored sites throughout Iowa, see the INHF's map linked below. V. A. Nuzzo, "Extent and Status of Midwest Oak Savanna: pre-Settlement and 1985," Natural Areas Journal, 6 (1986): p 6-36.